Podcast listening continues to grow in the United States (see my post here with the latest 2017 numbers). As a consequence of this increasingly popularity, new podcasts are being launched at a feverish rate. According to Libysn (the largest host of podcasts, including several of our shows here at Convince & Convert), they are serving up more than 6,000 new shows each year. That’s nearly 20 new podcasts launched every DAY, just on Libsyn. That’s a lot of audio. And it’s a lot of audio concentrated on top-of-the-funnel “thought leadership.” In fact, I’d argue that the overwhelming majority of podcasts in the business category are just that: Mechanisms to make their hosts and sponsors better-known, and an opportunity to build relationships with interesting guests. 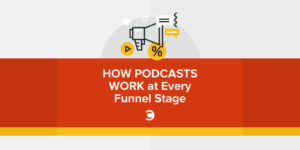 Most business podcasts are similarly conceived, but increasingly I’m seeing podcasts that also target a more specific, mid-funnel, or late-funnel audience. This is podcasting in place of (or as an augmentation to) traditional low-funnel content marketing like webinars, ebooks, and detailed YouTube videos. 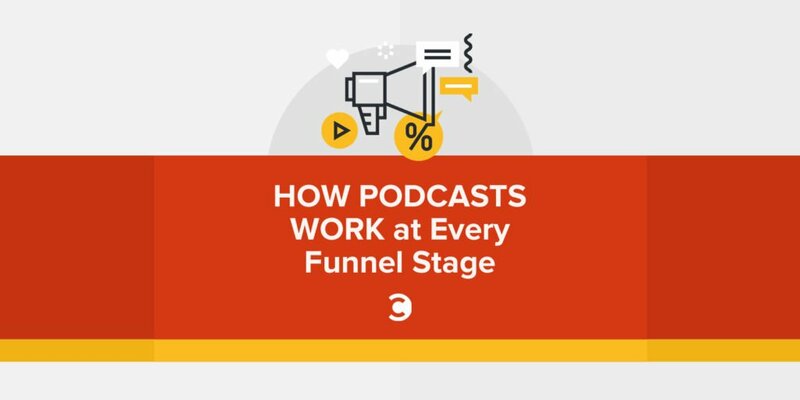 Here’s how podcasts can apply at every stage of the consideration funnel. These shows (like my Social Pros podcast) seek to grow notoriety for the hosts, and build early-stage connections with potential clients. For example, The Project Podcast is a show about how companies decide to relocate. Convince & Convert Media helped conceive and launch the show, and it stars and is managed by our friends at DCI, a public relations firm that specializes in economic development and tourism. 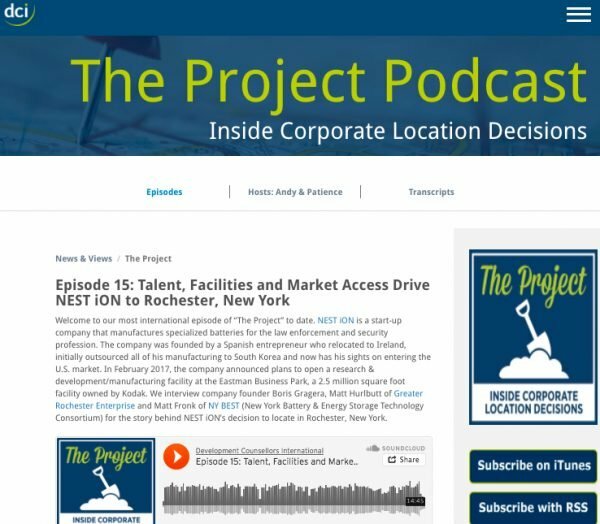 The Project Podcast is a terrific way for DCI to get on the radar of more potential clients in economic development. It’s the classic, top-of-the-funnel approach to podcasting value. Just two weeks ago, my daughter was deciding where to go to college in the fall. She narrowed it down to two choices, including Santa Clara University. 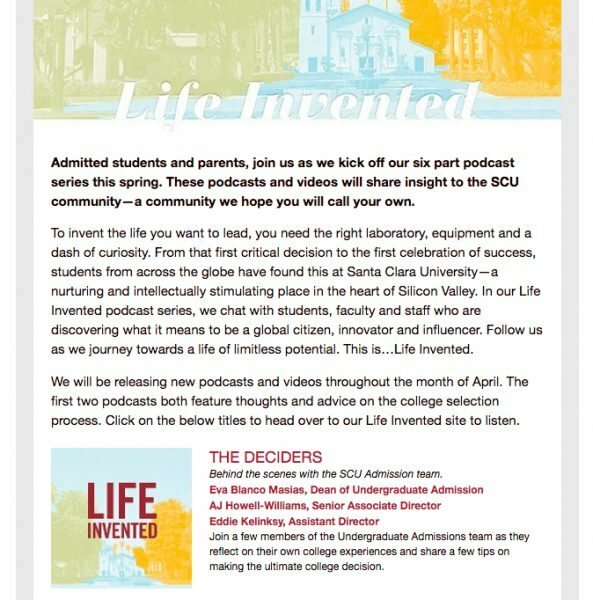 Wisely, Santa Clara launched a new podcast called Life Invented, that interviews admissions counselors and current Santa Clara students about how and why people go to school there, and what the experience is like. The team at Santa Clara emailed links to the show to all admitted students and their parents. This is a VERY smart move. We carefully listened to every episode and learned a lot about Santa Clara. I just love this idea. It got me thinking about a whole bunch of other ways to use audio and podcasting to engage with prospects whose information you’ve already gathered. There’s tremendous potential for HR too. Think about a podcast that is sent to new employees after they are hired, but before they start work. I can’t wait to work on this for corporate clients. One of our favorite clients is Insight, a Fortune 500 supplier of B2B and IT technology and services. 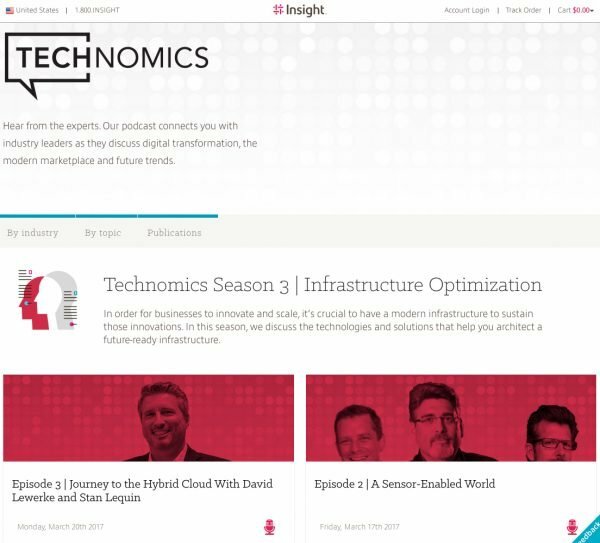 We worked with them to invent a podcast about digital transformation and trends. It’s called Technomics, and it targets current Insight customers and employees. Our team at Convince & Convert Media produces every episode (it stars Insight personnel on the mic). Each season has a theme that ties the episodes together. The current shows in season three focus on technology infrastructure optimization. Podcasts like Technomics are never going to have enormous audiences, but that’s not the point. What we’re doing with this show is delivering rich content to a known, high-value audience. This kind of bottom-of-the-funnel podcast is also very useful as a sales enablement tool, with the Insight sales team able to direct customers to specific, hyper-relevant episodes of the show. When you stop thinking of podcasts solely as a way to garner a big audience, you find many more strategically precise ways to use audio content. How could you use mid-funnel or bottom-funnel podcasts in your own organization? If we can help you, let us know. We’d love to work on something with you.